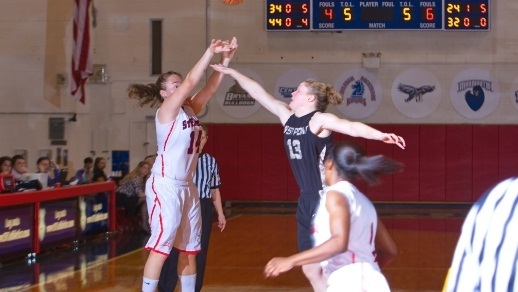 The St. Francis Brooklyn Women’s Basketball team beat the Army Black Knights of West Point 56-53 on Nov. 11, 2013. The Terriers are now 2-0 in their 2013-2014 season. The Black Knights are now 1-0. The Terriers had three athletes in double digits. Veney, Simpson and Benedetti all scored 10 points. Fechko and Kaufman added 9 points. Veney also had 10 defensive rebounds. The Terriers had 13 turnovers but outshot the Black Knights in the second half. Overall, the Terriers shot 40% from inside the arc, 29.4% from outside the arc and 75% from the free throw line. Although, the Black Knights outshot the Terriers for the whole game. Leading the Black Knights was Jenn Hazlet with 19 points, Kelsey Minato with 12 and Danielle Failor recorded another 10 points. Coach Thurston was very pleased at the way The Terrier’s came out and we’re able to pull out a win. “Tonight, Army pressed us much of the later part of the game, and in years past, we might have faltered but tonight I thought we did a great job expecting the pressure and making the right adjustments. I am very proud of our kids. This game’s is in the books, we got the victory, they can’t take that away from us, we’re happy and it’s on to the next game.” he said. The Terriers seem to be on a winning high after their performance against UPenn on Saturday. “Everything is how you bounce back, we won and we had two big wins. We have to bounce back and we can’t get too big headed and we have to play against St. John’s the same way we played against Army” commented Junior forward Jaymee Veney who scored her first season double-double. This Saturday, the Terriers take on the St. John’s Red Storm at Carneseca Arena at 2 pm. The SFBK Terriers head to the locker room leading the Black Knights 29-23. Veney has 8 points and 4 rebounds so far. Kaufman is behind her with 6 points, but she also has 2 fouls. Army’s Minato is leading her squad with 9 points and 1 rebound. The Terriers are outshooting the Black Knights phenomenally. Army is shooting 32% from the inside the arc, 27% from the behind the arc, and 50% from the foul line. SFBK is shooting 44% from inside the arc, 33% from beyond it and 100% from the foul line. The Terriers and the Black Knights are pretty even with turnovers.